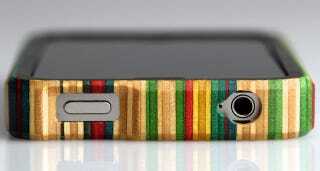 There are just five of Grove + MapleXO's skateboard deck iPhone 4 cases left, of the ultra-limited edition 50 piece range. Made over the course of a year, 300 skateboards were slices and sanded-down into layered strips, and constructed into cases. Pretty tricky craftsmanship, to say the least.